Available Interpretations in the period of church fathers. Fathers’ era (100-451 AD) is one of the most important periods in the history of Christianity thought so that Christian current thoughts try to refer the roots of their beliefs to that era. (McGrath, 2005: 32 and 33). In the Fathers era, although the belief in the Second Coming of Jesus had not been appeared as a quite regular belief, but Christians believed in it deeply. During this period, Christ’s Second Coming doctrine referred to the Apocalypse and was affected by its Jewish type (Sadeq nia, 2009: 239). Under the influence of the concept of forming a divine kingdom and the New Jerusalem in the book of Daniel, and especially the implications of the millennial reign of Christ in the book of Revelation, the idea of the earthly kingdom of Jesus Christ and his physical Second Coming had many fans among the early church fathers. For example, about the Second Coming of Christ and the final judgment, Justinian (165 AD), believed that Jesus will judge all the people who lived from the time of Adam to the end of creation after his Second Coming. “The righteous will be alive right after the destruction of the Antichrist and his followers and they will rule on the earth. They will live together with the angels and the New Jerusalem will be established on earth after it was restored by Christ. The human race will be created in a new form so that no one will grow old. At First the righteous will be revived, and then those who committed evil deeds will be resurrected and judged” (Adli, 2010: 186). Believing in the Second Coming of the Christ and the Millennium beliefs can be seen in the works of other fathers like Tertullian, Lactantius and Cyprian. But some Fathers have presented different interpretations of this doctrine. In the following text we will investigate the interpretation of two of the most influential church fathers, namely Origen and Augustine. After two centuries of fruitless waiting for Christ’s Second Coming, doubts were raised about this doctrine in the late second century and even the book of Revelation was sometimes questioned. In such an atmosphere, some began making spiritual interpretations of this doctrine. Origen (185-254 AD) was born in Alexandria in the late first century AD and grown up in the same atmosphere. Origen with adherence to the ideas of its predecessor, Clement of Alexandria, attempted to reconcile Christian faith with Hellenistic teachings in a way that Christianity can be rendered as the perfect culmination point of all religions. Origen divides all Christianity into three major parts: God and all His manifestations, the fall of the creatures’ spirits from heaven, salvation and complete Resurrection. Although Origen’s interpretation of Christian doctrine got not completed, but he was a pioneer in spiritualization of the doctrine of Christ’s Second Coming. As the Resurrection was concerned, Origen believed that in “the Apocalypse” all creatures will resurrect. And finally God will be all in all and even the evil spirits will be salvaged and evil will be destroyed completely and everything will return to its pure and original spiritual status. He considered eternal salvation for all, although he was not so sure about the salvation of the Satan and the banished angels. He referred to the I Corinthians treatise to defend his views; it is stated there that finally, God would be “all in all” (15: 27-28); accordingly, there is forgiveness for everyone in the end (Kung, 2003). Although In the fourth century there were still tendencies towards the apocalyptic Second Coming of Christ and millennial kingdom – For instance, Lactantius wrote one of the most detailed books on the subject in this period – however in this period, the literature of the Apocalypse and millennial kingdom had been superseded. Even those who believed in the physical Second Coming of Christ and his kingdom in its literal sense – like Matthews from Olympus and Victorinus of Pettau who wrote the oldest commentary on the book of Revelation – didn’t believe in the earthly views of the second century AD. Some authors believe there were two factors which abolished the belief of the physical Second Coming of Christ in this era: One of them was the conversion of Constantine to Christianity which made Christianity to transform into a tolerant and even victorious religion from a persecuted religion and the other one was the emergence of interpretations that were based on inner nature trend of thought and were signifying figurative and spiritual meanings more (Sadeq Nia, 1388: 240). Augustine (354-430 AD), was the most prominent theologian who opposed the literal understanding of the Revelation book. He reconsidered the Christian views concerning the history and society. The pivotal point of this position was not only to reject the political views of authors like EUSEBIUS and AMBROSE, who used to bond the fate of Rome and Christianity together and interpreted messianic promises in terms of the Christian Roman Empire, but also to attack any theology of the Apocalypse; theologies which were using the last book of the New Testament as a model for the interpretation of the history and the Apocalypse. Augustine offered two alternative spiritual interpretations of millennial rule in the twentieth chapter of the book of Revelation: Thousand year reign of Christ means either the success of Christianity in exorcising the Satan and evil and imprisoning it in the hearts of evil doers in the early period of Christianity or all the years after Christ; For, a perfect time may be expressed by a whole number (e.g. thousand). According to both interpretations, “The church is already in the kingdom of Christ and the kingdom of heaven. And so, now the saints rule alongside him, although it is different from what it would be in the next world” (ibid.). Christian believers live in a period between the incarnation of Christ and his glorious Second Coming; as a result, the church (the community of believers) is in the period of exile and although it is in the world but it is not. In the book “City of God”, Second Coming of Christ has been interpreted as a spiritual being without body, along with other eschatological elements such as millennial kingdom of Christ together with the righteous, Satan’s failed attack which would be neutralized immediately by God, resurrection, the final judgment, and the creation of a new heaven and a new earth. Augustine, by referring to the end of the world, considers the judgment day as the separation of divine and earthly cities. Augustine, historically, considers Jerusalem as the City of God; the city of prophets, the place in which Judaism and Christianity were formed and the symbol of faith. Babylon is the “Secular City”; the city which is the center of idolatry and materialism. He considers the Catholic Church as the historical form of Heavenly Jerusalem and the City of God (Ilkhani, 1382: 115). Augustine is completely sure that the kingdom of God in this earthly and mundane era has a physical form and it is the Catholic Church: The church is the very embodiment and manifestation of God’s kingdom on earth but it is not completely the same as the City of God; as it is still influenced by the Secular City. According to Augustine, it is only the God who knows the chosen ones. According to Augustine, the Judeo-Christian conception of the church by itself can be considered as a teleological movement and would be guided, by God, towards the Eternal City, the kingdom of peace and the kingdom of God (Kung, 2003:121). About the Augustine’s interpretation of the return of Jesus Christ, it can be said: He, after depicting the City of God and the Secular City, believes that Christian believers are living in a period that is between the embodiment and the early coming of Jesus Christ and his final return and his second coming. There was already a similar interpretation in the writings of the apostle Paul that apparently the church is in a period of exile and is away from its origin. 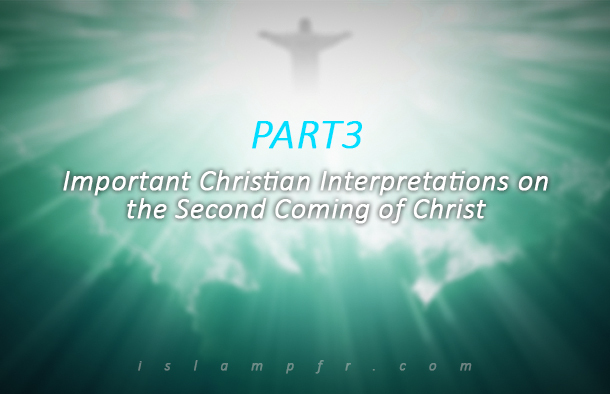 He spiritualizes the Second Coming of Christ by a realistic interpretation and gets away from the rudimentary interpretations which are based on the physical and imminent Second Coming. But, it should not be considered as denial of the Second Coming of Christ since a deep eschatological attraction can be seen in the works of Augustine. The opposition of Augustine and other authorities of the Catholic Church, prevented the literal comprehension of twentieth chapter of the book of Revelation at least in the Latin world for a thousand years later. Consequently, in the Middle Ages there was no attention to the eschatological concepts and nobody paid attention to this doctrine. However, during this period there were also some tendencies towards millenarian and some kind of earthly happiness was expected. One of the very well-known figures in the Catholic Church, Joachim of Fiore (1135-1202M), tried to depict tendencies towards millenarian in terms of the Christ’s Second Coming. He was the first who transformed some of the mild eschatological views into a historical theology. He offered new interpretation of Christ’s Second Coming and millennialism which was based on the book of Revelation and not the book of Daniel. In his opinion, Augustine was right to believe that the Christ’s Second Coming and millenarian should not be understood and interpreted earthly and literally, but he was wrong to maintain that the twentieth chapter of the book of Revelation does not ensure a better prophesied future for the church. Joachim considers three periods of survival for the history of Church and Christianity: The period of the Father, the period of the Son and the period of the Holy Spirit. In his opinion, the next period which is a better one for the church and it is the monastic period of peace after the defeat of the Antichrist, is the called the “Period of the Holy Spirit”. In Joachim’s millennialism, the Pontifical Foundation also had both a positive role and a negative role. On the one hand, he raised the hope for coming of a new leader as a Pope, at the end of the second period and before the start of the third period and on the other hand, according to some reports, he feared lest the Antichrist is already born and has usurped the Holy See (Ajeer, 1384: 210; Sadeq Nia, 1388: 241). During this period, although the interpretations of the concept of Christ’s Second Coming and earthly millennialism did not mean to be materialistic, but it was increasingly worldly and political. Some non- religious and religious events were considered as signs of the coming of Judgment Day, including: change of head and members of the Church, alliance of the Church of Rome with Church of the East, peace in Italy, Crusades and the conquest of the Holy Land, Jews’ and Muslims’ conversion to Christianity. Some unfortunate events like major Western schism led the schism period (i.e 1378 to 1415) to be recognized as the period of the Antichrist and made people expect the last emperor who was often called the second Charlemagne. Renaissance thinkers’ were fascinated by the classical traditions related to the return of the “Golden Age” and new geographic areas were explored. These were considered as the expansion of the Christian world or proclaiming the message of Jesus Christ to other nations and a prerequisite for the coming of a better world. The Famous explorer, Christopher Columbus, in his letters of discovery and especially in his book of prophecies which was written with the help of a priest, has clearly used the concepts related to the Apocalypse and regarded the discovery of the New World as the gateway to the re-conquest of Jerusalem which must be fulfilled by the Kingdom of Spain as the last emperor of the world. Negative factors that had disastrous aspect and were possibly attributed to anti-Christ, were in turn divided into partial and general factors. Partial factors include events such as the invasion of Italy by Charles VIII in 1494 AD and the sack of Rome in 1527 AD, and the general factors include the growing crisis of the modern era, the growing threat of the Turkish Empire and reformist movement. The conquest of Constantinople In 1453 by the Turks and their progress towards Europe made the belief in the last emperor of the world in terms of waiting for Christ’s return come alive once more. Predictions emerged about overcoming a quasi-messianic figure on the Turks; for example, a German priest named Wolfgang Itinger in 1496, predicted that the Turks will be defeated by the last emperor in 1506 AD. But he wasn’t sure who will be the last emperor, if he is Philip of Burgundy or Ladislaus from Poland. , . Another work in this period which deals with these issues is an interpretation of the book of Revelation by Anious from Viterbo. In this interpretation, he considers the first fifteen chapters of the book of Revelation, as prediction of events in the world and the Church until the fall of Constantinople and introduces the Prophet of Islam as the anti-Christ. He also considers the sixteenth and seventeenth chapters as the prophecy of Turks’ victories and the eighteenth and nineteenth chapters as the prophecy of the appointment of a victorious emperor by the Pope and his victory over the Turks and believes that the twentieth chapter is the prophecy of the Church’s millennial rule over the world (McGinn, 2001: 8).